Her blog is full of life, delight and all of her recipes 'tastes like home'. I am a great of hers and bookmarked almost every dish. :) Now, she even published her own cookbook - 'My Caribbean Cookbook: Tastes Like Home'. How cool is that! "Barbados’ national dish is cornmeal cou cou and flying fish. Long ago, cou cou used to be a regular every-Saturday dish in many households just as pudding and souse is, but these days, because of the time it takes to prepare, a lot of people have stopped making it regularly. If we’re not careful, the technique of making good cou cou will fade away as we all get busier, eating out becomes the norm, and those with the knowledge of making cou cou leave this world without being able to pass on this traditional dish." Click here for the detailed recipe instructions. Cornmeal coucou is looking good. 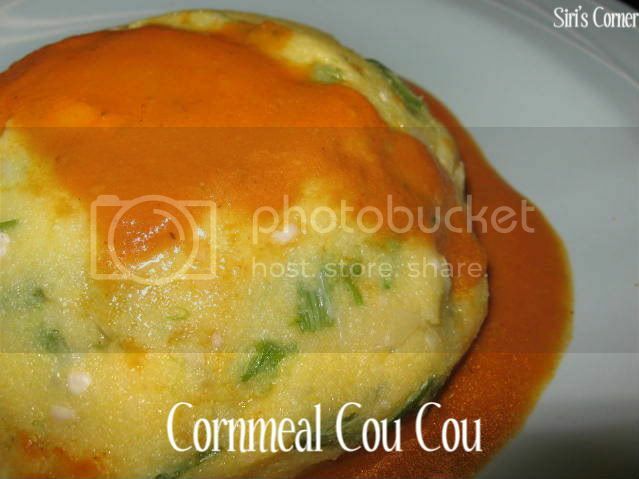 Cornmeal Coucou looks really like a delight..yumm..Oh I can't stay without shopping for week.. Very beautiful dish, looks simply superb!! Cynthia is definitely the perfect reference for anything Carribean. I have made a few of her vegetarian dishes with success. I just love cornmeal! What a fantastic dish. Siri, this looks great. I really enjoy trying out different recipes using cornmeal and I have to try this. A lovey entry for the MM theme - thanks! Great entry...looks delicious and beautiful. Such a delicious looking dish - we share a lot in common with Caribbean cooking dont we? Congrats!! the cornmeal Cou Cou looks delish!! This looks so yum Siri..congrats on winning!